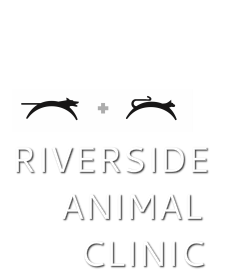 Here at Riverside Animal Clinic, our goal is to care for your four-legged family members by providing the best service and medicine available. From wellness care and nutritional counseling, to injury and disease treatment, we are dedicated to high-quality, personal attention for both you and your pet. If you've been by the office recently, you know that our parking lot is receiving a (much needed!) expansion. We thank you for your patience during the construction! Thank you for once again voting us "Best of the Best." It's a privilege to serve our clients and care for your four-legged family members. For the most current listing of pet food recalls and alerts, see the AVMA page. We continue to track outbreaks of Canine Influenza in Michigan and around the United States. Riverside Animal Clinic does have the vaccine available for dogs with exposure possibilities. If you feel your dog may be at risk of exposure, please call the office for current vaccination guidelines. Want to know more? Here is a list of Frequently Asked Questions regarding Canine Influenza. As of now, there is no definitive relationship relationship between grain free diets and the development of dilated cardiomyopathy. These ingredients have long been added to human and pet food as a source of protein. What has changed is the amount, or proportion, of these ingredients included in pet food. If you are feeding the food for no medical reason, then consider changing foods. If you are feeding this food as a treatment for a current disease, then please continue this food and plan to discuss this at your pet's next appointment. Our veterinarians will discuss whether testing your dog's blood taurine levels is advisable at that time. If your pet is having any coughing, lethargy, wheezing, or exercise intolerance, please schedule an appointment to evaluate cardiac function. We are continuing to stay up to date with recommendations regarding this concern. As new information is gathered and questions become answered, we will continue to disseminate any new recommendations as they come. The care of your dog, and you, are our concern and privilege. When your pet has an emergency, being prepared is very important. Before an emergency strikes, make sure you have Riverside Animal Clinic's information on hand for business hour emergencies, as well as contact information for Great Lakes Pet Emergency for after hour emergencies (find that information here). You can also stay prepared for emergencies by putting together a pet first-aid kit. We cannot stress enough that you SHOULD NOT get on-line during a pet emergency or when your pet is seriously ill. In an emergency, first aid is not a substitute for veterinary treatment. However, before you are able to get your pet to a veterinarian, knowing some basic first aid can help. Always seek veterinary care following first-aid attempts. Bite Wounds Approach the pet carefully to avoid getting bitten. Muzzle the animal. Check the wound for contamination or debris. If significant debris is present, then clean the wound with large amounts of saline or balanced electrolyte solution. If these are not available, then regular water may be used. Wrap large open wounds to keep them clean. Apply pressure to profusely bleeding wounds. Do not use a tourniquet. Wear gloves when possible. Bite wounds often become infected and need professional care. Call your veterinarian. Bleeding Apply firm, direct pressure over the bleeding area until the bleeding stops. Hold the pressure for at least 10 straight minutes (continually releasing the pressure to check the wound will hamper the clotting). Avoid bandages that cut off circulation. Breathing Stops Check to see if the animal is choking on a foreign object. If an animal is not breathing, place it on a firm surface with its left side up. Check for a heartbeat by listening at the area where the elbow touches the chest. If you hear a heartbeat but not breathing, close the animal’s mouth and breathe directly into its nose--not the mouth--until the chest expands. Repeat 12 to 15 times per minute. If there is no pulse, apply heart massage at the same time. The heart is located in the lower half of the chest, behind the elbow of the front left leg. Place one hand below the heart to support the chest. Place other hand over the heart and compress gently. To massage the hearts of cats and other tiny pets, compress the chest with the thumb and forefingers of one hand. Apply heart massage 80-120 times per minute for larger animals and 100-150 per minute for smaller ones. Alternate heart massage with breathing. Please note: Even in the hands of well-trained veterinary health professionals, the success of resuscitation is very low overall. Success may be slightly higher in the cases of drowning or electrical shock. Burns(Chemical, electrical, or heat including from a heating pad) Symptoms: singed hair, blistering, swelling, redness of skin. Flush the burn immediately with large amounts of cool, running water. Apply an ice pack for 15-20 minutes. Do not place an ice pack directly on the skin. Wrap the pack in a light towel or other cover. If the animal has large quantities of dry chemicals on its skin, brush them off. Water may activate some dry chemicals. Choking Symptoms include difficulty breathing, excessive pawing at the mouth, blue lips and tongue. Be sure to protect yourself as well as the animal, as the pet will likely be frantic and may be more likely to bite. If the pet can still partially breathe, it’s best to keep the animal calm and get to a veterinarian as quickly as possible. Look into the mouth to see if foreign object in throat is visible. If you can, clear the airway by removing the object with pliers or tweezers, being careful not to push it farther down the throat. If it is lodged too deep or if the pet collapses, then place your hands on both sides of the animal’s rib cage and apply firm, quick pressure. Or place the animal on its side and strike the side of the rib cage firmly with the palm of your hand three or four times. Repeat this procedure until the object is dislodged or you arrive at the veterinarian’s office. Diarrhea Withhold food for 12-24 hours, but not water. Sometimes pets that appear to be straining are sore from diarrhea rather than from constipation. Your veterinarian can help you decide which it is and what will help. Trying at-home treatments without knowing the real cause can just make things worse. Fractures Symptoms include pain, inability to use a limb, or limb at odd angle. Muzzle the pet and look for bleeding. If you can control bleeding without causing more injury, then do so. Watch for signs of shock. DO NOT TRY TO SET THE FRACTURE by pulling or tugging on the limb. Transport the pet to the veterinarian immediately, supporting the injured part as best you can. Heatstroke Symptoms include rapid or labored breathing, vomiting, high body temperature, collapse. Place the animal in a tub of cool water. Or, gently soak the animal with a garden hose or wrap it in a cool, wet towel. Do not overcool the animal. Stop cooling when rectal temperature reaches 103 degrees Fahrenheit. Poisoning Symptoms include vomiting, convulsions, diarrhea, salivation, weakness, depression, pain. Record what the pet ingested and how much. Immediately call your veterinarian or poison control center. Do not induce vomiting. In case of toxins or chemicals on the skin from oils, paints, insecticides and other contact irritants, request directions on if and how to wash the toxin off. Seizures Symptoms include salivation, loss of control of urine or stool, violent muscle twitching, loss of consciousness. Move the pet away from any objects that could be harmful during the seizure. Use a blanket for padding and protection. Do not put yourself at risk by restraining the pet during the seizure. Time the seizure. They usually last only 2 to 3 minutes. Afterwards, keep the animal calm and quiet. Shock Symptoms include irregular breathing, dilated pupils. Shock may occur as a result of a serious injury or fright. Keep the animal gently restrained, quiet, and warm, with the lower body elevated. Vomiting Withhold food for 12-24 hours. Give the pet ice cubes for two hours after vomiting stops, then slowly increase the amount of water and foods given over a 24-hour period. If you need to muzzle your pet use a strip of soft cloth, rope, necktie, or nylon stocking. Wrap around the nose, under the chin and tie behind the ears. Care must be taken when handling weak or injured pets. Even normally docile pets will bite when in pain. Allow the pet to pant after handling by loosening or removing the muzzle. Do not use a muzzle in a case of vomiting. Cats and small pets may be difficult to muzzle. A towel placed around the head will help control small pets. If your pet can’t walk, a door, board, blanket, or floor mat can be used as a stretcher to transport injured or weak animals. Poisoning Symptoms include vomiting, convulsions, diarrhea, salivation, weakness, depression, pain. Record what the pet ingested and how much. Immediately call your veterinarian or poison control center. Do not induce vomiting. In case of toxins or chemicals on the skin from oils, paints, insecticides and other contact irritants, request directions for if and how to wash the toxin off.